Named after Lughnasadh, an ancient Irish harvest festival, the band is rooted in the best of Irish traditional music, with a jazz-inspired regard for improvisation. 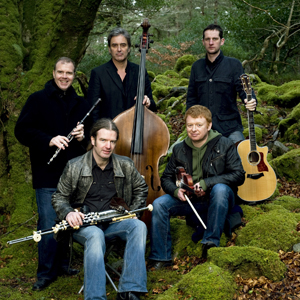 The musicians in the band have been the backbone of many of the great Irish groups of recent years. Trevor Hutchinson, formerly of The Waterboys, plays bass. Kevin Crawford, formerly of Moving Cloud, plays flute. Sean Smyth, formerly of Donal Lunny’s Coolfin, plays fiddle. Cillian Vallely plays pipes, and Ed Boyd plays guitar. The band has recorded eight albums, including their most recent, Lá Nua, which the newspaper Irish Echo ranked as the #2 Traditional Album of 2010. 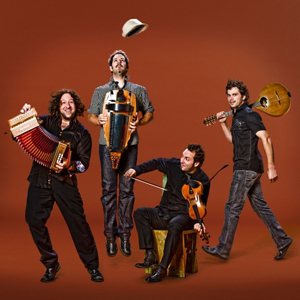 Le Vent du Nord hits the stage with the unstoppable force of its namesake, the north wind. The four members of the band – Nicolas Boulerice, Olivier Demers, Simon Beaudry, and Réjean Brunet – all sing, all play multiple instruments, and all perform with irresistible energy and infectious verve. Veterans of famed groups like La Bottine Souriante and Ad Vielle Que Pourra, these youthful ambassadors of the current roots revival in Quebec play their own dynamic arrangements of traditional Quebecois songs and dances, as well as plenty of fresh original music. Their fine harmony singing and richly textured mix of fiddle, guitar, and hurdy-gurdy make for a truly uplifting evening – in the sense that you'll be lifted up off your chair and into the aisles to dance! Tonight’s show promises a rare treat for lovers of high-energy roots music from Ireland and Quebec.